... and may not extract all the impurities building up inside the pores. Dead Sea Facial Scrub - formulated to give a complete cleansing of the skin. - it involves the removal of the oldest dead skin cells on the skins's outermost surface, to help maintain healthy skin. Jericho Foaming Facial Scrub is a powerful yet very gentle exfoliating cleanser, recommended for daily use. Rich in , vitamin C, enriching jojoba oil and calming Chamomile extract, it softens the skin and promotes tension relieving. It removes dead skin cells, unclogs pores and extract toxins and impurities from the deep layers of the skin to create a smoother, even-toned skin surface. One of the natural wonders of the world is the Dead Sea, which is 1,200 feet below sea level. Hot dry air and high evaporation rate have contributed to the high salt concentration present in the Dead Sea, making it one of the saltiest lakes in the world. 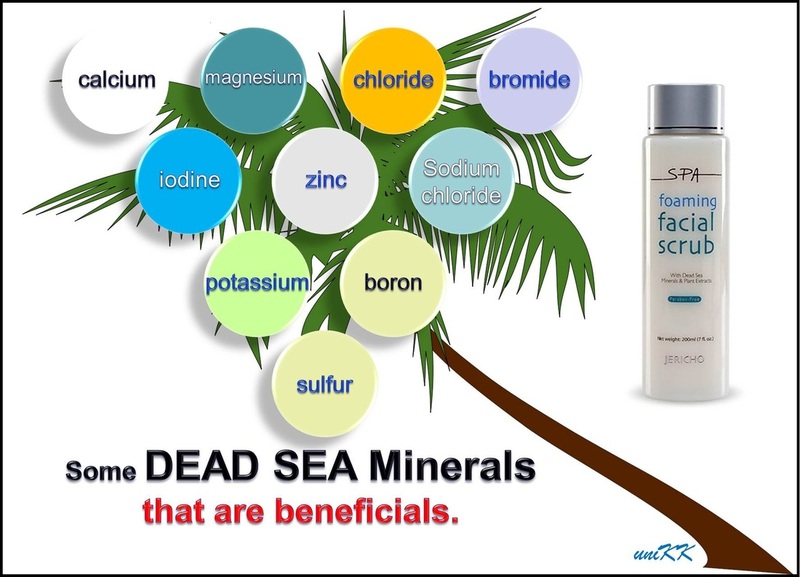 Compared to the 3% salt content of ordinary sea water, researchers claim that the Dead Sea water contains 32% salts with relatively high concentration of 21 minerals such as magnesium, calcium, bromide and potassium. Twelve of these minerals are not found in another other sea or ocean. Potassium -o- improves oxidation, stimulates and maintains nerve signals and muscle contractions, necessary to maintain water balance in order for cell metabolism to take place, assists cells to absorb nourishment and expel waste products. An imbalance of potassium often leads to water retention. 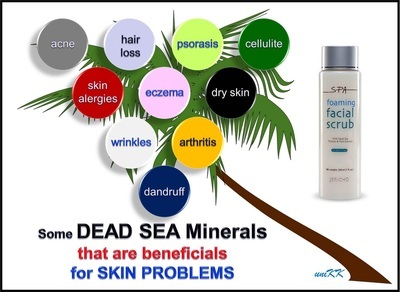 Signs of potassium deficiency include abnormally dry skin and acne as well as flare ups of Psoriasis. Sulfur -o- necessary for secretion of bile from the liver and for converting toxins into non-toxins. Has also been shown effective to help relieve symptoms of skin disorders such as Psoriasis and Eczema. Available now in 200 ml packaging.